Instead of using a handlebar computer you train by connecting the Vortex quickly and easily to the Tacx Cycling apps. If you want to train with a PC or laptop you can purchase the Upgrade Smart. Of the many possible training options, you can choose the software that best matches you and your way of training. The Vortex communicates wirelessly via ANT+ and Bluetooth® wireless technology. You can attach your tablet or smartphone to your handlebar with a special bracket (optional). The Vortex (T2180) Smart Trainer is compatible with various open third party software platforms, as well as the free Tacx software, that will help and make your training session much more fun and realistic. The Vortex communicates wirelessly via ANT+ and Bluetooth® wireless technology. You can attach your tablet or smartphone to your handlebar with a special bracket (optional). The Vortex (T2180) Smart Trainer is compatible with various open third party software platforms, as well as the free Tacx software, that will help and make your training session much more fun and realistic. The electro brake is suitable for an average training level. The gradient of the road is converted into resistance on the bike by creating a magnetic field. It can reliably simulate the road up to 7%. This brake does not simulate any descents. The Vortex Smart works with an electro brake. By placing magnets and electro magnets beside a rotating aluminium disc, eddy currents are created which generate an opposing magnetic field. In this way, a non-contact, maintenance-free brake is realised that it's also silent. Thanks to the electro brake a resistance can be set that you also experience on the road or in a climb. The electro brake does not have a downhill drive, such as the motor brake of the i-Genius, and it generates less power while riding uphill. When you are cycling in a virtual terrain or in a film you can get outside the range for which the brake is intended. To allow cyclists with a motor brake and cyclists with an electro brake to ride races against each other in Multiplayer, Tacx has developed the virtual speed. This concept translates the energy supplied into a certain speed, which can guarantee a fair contest. If this speed differs from the speed at which the rear wheel is running, the virtual speed will be shown on the screen in red. The Tacx Cycling app for tablets and smartphones are quick and easy to use. With the Tacx Cycling app for tablets you can ride classic cycling races and legendary stages. You can also create your own training programmes and train according to heart rate, slope or power output, or use the pre-set fitness level tests. All your performance data is measured and displayed while you are cycling and stored so you can analyse them at a later stage. The Tacx Cycling app for smartphones allows you to train freely based on heart rate, slope or power output. Your performance data is displayed while you are cycling in form of ‘dynamic’ graphs. The applications for tablets and smartphones can be used in combination with any interactive Tacx trainer, in some cases, an upgrade is needed. Download the Tacx Cycling app free of charge from the App Store or Play Store. There are applications for iPads, Android tablets, iPhones and Android smartphones. You can order and download Tacx films using a Tacx Cycling app for tablets. 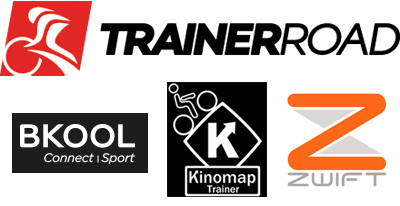 The films of the Tacx Cycling app cannot be combined with films of the Tacx Trainer software. Tacx Vortex Smart Trainer is rated 4.2 out of 5 by 102. Rated 1 out of 5 by GazzaF from Simply Doesn’t Work Probably, no definitely the worse Tacx trainer I have ever had the dissatisfaction of owning. From the very get go there was terrible tyre slippage which I emailed Tacx about and all they kept saying was “we can see the problem from the photos you have sent, please follow the setup video we have sent you”. The Vortex was set up exactly as the video instructions but still I had to email Tacx, who said the same thing over and over again. Eventually I asked them “if you can see the problem, then perhaps you’d be kind enough to tell me what it is”. Having used the Vortex 3-4 times I popped to the garage to have quick spin but this time the Bluetooth wouldn’t connect. After 15-20 mins I decided to box it up and return it to Wiggle. If I’m honest, that’s where more problems arose. It transpires that I now have to wait for the Warranty Team to look at the Vortex before I can get a refund for what is a faulty item. I would really rather order a different Smart Trainer, (from Wiggle), but it seems that I might be stuck with a Vortex and no support from Tacx and not great support from Wiggle either. Will this adjust resistence in sync with Zwift? Yes it does providing you update the firmware via the Tacx utility App first....I have and works great with Zwift and you can really feel the resistance change! It actually mimics downhill very well too, I was really impressed with it. Do as Zwift suggest though and get a usb extension cable for your ANT+ usb so the signal doesn't drop off...Im very happy with mine and bought mine just for full Zwift control. Will my Garmin Edge 520 be able to control this trainer as well as gain the information from it, i.e. is it the Ant+ FE-C version? Pairing to Zwift on iPad via Bluetooth with resistance? Does this include an Ant+ dongle? I want to buy a smart turbo trainer and use zswift on my iPad. Can someone please give me a super easy guide on what else I need to do this? I.e ant+ sensor and then a USB adapter? Or will it work out of the box? Sorry but I'm struggling here ! You will need an ANT+ dongle to link this up to you ipad, We do stock a Apple 30 pin dongle but depending on which version of Ipad you have you many also need to purchase an adapter. How many years warranty does the product come with please? I currently have a hub based powertap PM which transmits via ANT+ to my Garmin 920XT, if I was to replace my basic model turbo with the Vortex Smart turbo and run a standard rear wheel would I be able to view my power readings by pairing the Vortex to my 920XT? This smart trainer will work with the 920XT once paired. Will any QR skewer work? I can confirm you would require the Tacx trainer skewer and one should be included with the trainer in the box. Does the Vortex smart fold up? Also can the power cable be removed for storage? I am 99% certain that it does and there is a picture of it folded up on the Tacx website ... BUT you have previously answered this question and said it doesn't fold up. Please clarify (and assuming the previous advice was incorrect, probably best to change it) Also can the power cable be removed from the brake? Will this work with a 24&quot; wheel?